Has peace finally come to the Middle East? Will the peace treaty signed last March by Israel and Egypt bring an end to decades of Mideast hostility? Or will it simply provide a short respite — a lull before the storm? Where are Mideast events leading? Can we know what lies ahead in this foremost of trouble spots? After confronting each other in a state of war for nearly 31 years, Egypt and Israel signed a formal treaty at the White House last March 26 to establish peace and open "normal and friendly relations." As millions looked on via television, President Anwar Sadat of Egypt and Prime Minister Menachern Begin of Israel put their signatures on the Arabic, Hebrew and English versions of the first peace treaty between Israel and an Arab country. President Carter, signing as a witness for the United States, declared: "Peace has come," adding that "we have won, at last, the first step of peace — a first step on a long and difficult road." All three leaders joined together in offering prayers that the treaty would bring true peace to the Middle East and end the animosity that has four times erupted into warfare since Israel declared its independence in May 1948. Many have been swept up in the euphoria generated by the signing of this historic treaty. But will the treaty really bring the peace which has eluded the region for decades? Or are uncontrollable events soon destined to rupture the delicate fabric of "peace" in this volatile part of the world? What happens in this strategic area is of vital concern to nations in every part of the globe. 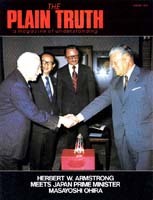 For over 40 years The Plain Truth has urged its readers to keep their eyes on the Middle East — the focal point of all Bible prophecy. What does the Word of God say about the chances for peace in this explosive region? Where is the Middle East headed? Can we really know? There is a Creator God who knows the past and can fathom the future. He has given us in His Word, the Holy Bible, many hundreds of prophecies which foretell future events. The Creator says: "... For I am God, and there is none else; I am God, and there is none like me, declaring the end from the beginning, and from ancient times the things that are not yet done, saying, My counsel shall stand, and I will do all my pleasure" (Isa. 46:9-10). It is God who knows the end from the beginning. His Word, if diligently studied and rightly understood, reveals to mankind many of the major events about to occur in the Mideast. The prophet Daniel prophesied that four great world-ruling empires would arise one after the other (see Daniel 2 and 7). These empires would dominate this earth up until the end time when the "stone" (the Messiah or Christ — see Daniel 2:45 and Ephesians 2:20) will demolish and supplant all human governments. The longest prophecy of the Bible, the eleventh chapter of Daniel, specifically concerns the Middle East. Most of this lengthy prophecy has already been fulfilled. The first four verses of this chapter foretold that "a mighty king" (Alexander the Great) would rise up and defeat the Persians. He would die without "posterity" to rule on his throne. His kingdom would be "divided toward the four winds" (by his four generals). Then we come to the very detailed prophecy concerning a prolonged struggle between the Seleucid kings of "the north" (in Syria) and the Ptolemaic kings of "the south" (in Egypt). History shows how accurately the detailed prophecies of verses 5-39 were fulfilled. (For a description of the historical fulfillment of these verses, read our free article entitled "The Middle East in Prophecy.") But verses 40-45 are yet to be fulfilled. They reveal that startling events are yet to take place in the Mideast. As foretold, after the death of Alexander the Great his four generals divided up his kingdom. Cassander ruled Greece and Macedonia. Lysimachus was given Asia Minor. Seleucus (Nicator) ruled Syria and Babylonia as far as India. Ptolemy (Soter) ruled Egypt, part of Ethiopia (including the modern Sudan), Judea and part of Syria. The kings of the north and south referred to in this chapter were the Greek rulers of Egypt and Syria who for centuries struggled over control of Palestine. The Bible always speaks from the focal point of the Holy Land. Syria was north of Palestine; Egypt was south. The "king of the north" continued to be Syria up until 65 B.C. From that time on the "king of the north" represents the Roman Empire. Rome is the fourth and last of the world-ruling empires which Daniel prophesied would dominate this world (Daniel 2 and 7). The Roman Empire would meet catastrophe and be revived again and again. It would continue to reappear until the Messiah appears on the scene and destroys all human kingdoms and governments, and establishes the Kingdom of God. The ancient Roman Empire fell to the Heruli and their allies in A.D. 476. Then Justinian revived the Roman Empire in the West in A.D. 554. It was, in our time, revived by Benito Mussolini. II Duce, the leader, ruled the sixth major revival of the Roman Empire. According to the prophecies of your Bible, there were to be seven major "heads" (leaders) or seven revivals of the Roman Empire, beginning A.D. 554 when the "deadly wound" was healed by Justinian (Rev. 13:3-5). The other "resurrections" of the Roman Empire include those of Charlemagne, Otto the Great, Charles the Great (of the Hapsburgs), Napoleon and Mussolini-Hitler. The seventh and final revival is yet to occur. Students of biblical prophecy generally understand that the fourth kingdom mentioned by Daniel (depicted by the legs of iron and feet part of iron and part of clay) is the Roman Empire (Dan. 2:32-45). "And in the days of these kings [ten kings represented by the "ten toes"] shall the God of heaven set up a kingdom, which shall never be destroyed: and the kingdom shall not be left to other people, but it shall break in pieces [smite the image on its feet and toes of iron and clay] and consume all these kingdoms, and it shall stand for ever" (Dan. 2:44). The seventh chapter of Daniel lists four beasts: lion, bear, leopard and a "fourth beast, dreadful and terrible," unlike any beast known to mankind. Daniel was inspired to foretell the destruction of this fourth beast (the Roman Empire): "... I beheld even till the beast was slain, and his body destroyed, and given to the burning flame" (Dan. 7:11)..
Then follows the coming of the Messiah to this earth in power and glory: "I saw in the night visions, and, behold, one like the Son of man came with the clouds of heaven.... And there was given him dominion, And glory, and a kingdom, that all people, nations, and languages, should serve him: his dominion is an everlasting dominion, which shall not pass away, and his kingdom that which shall not be destroyed" (verses 13-14). Very few understand that the Roman Empire is to exist, quite literally, at the coming of the Messiah, and once again will wreak great havoc in the name of "peace" — just before the establishment of the prophesied Kingdom of God on this earth. Immediately after World War II, Winston Churchill, in a speech at Zurich, Switzerland, urged the creation of a "United States of Europe." Since that time, many steps have been taken toward achieving this goal (the most recent being the first — ever direct election to an expanded and strengthened European Parliament). A New Europe is coming as certainly as the sun will continue to rise and set. Many Europeans realize they will remain impotent as individual nations unless they can bind themselves together in a strong union. Only then can they speak with a united voice and exercise their political and military power to utmost advantage. The most recent war in the Mideast Painfully underlined Europe's weakness in international disputes. The nations of the European Economic Community (EEC) were forced to stand by as the United States and Russia made the important decisions concerning the October 1973 Middle East struggle. Europeans charge that they were not only not consulted, but they were only informed belatedly, after the international situation in the Mideast had deteriorated to the point where the United States felt impelled to put her forces (including those on European soil) on full alert. Europeans now are demanding a bigger say in what goes on in the world — including the Middle East, where their umbilical oil line could be severed without either their knowledge or consent. The Common Market maker's have appealed to the Organization of Petroleum Exporting Countries (OPEC) for greater cooperation between the two blocs. In order to have more freedom to maneuver in future crises, Europeans are continuing to consider steps to bring about their own political and military independence from United States control and influence. Daniel prophesied over 2500 years ago that Europe will sooner or later end up with a strong central government like that of the ancient Roman Empire. This strong United Europe is foretold in the seventeenth chapter of Revelation: "And the beast [the final manifestation of the Roman Empire] that was, and is not, even he is the eighth [head], and is of the seven [of the seven heads of Daniel 7:4-7], and goeth into perdition" (Rev. 17:11). Now notice that "the beast" (the leader of this final revival of the Roman Empire) will have under his control and direction the full power of "ten kings" or ten rulers who will give him full allegiance: "And the ten horns which thou sawest are ten kings, which have received no kingdom as yet; but receive power as kings one hour with the beast. These have one mind, and shall give their power and strength unto the beast. These [the beast and the ten kings] shall make war with the Lamb [Christ at His coming], and the Lamb shall overcome them: for he is Lord of lords, and King of kings..." (verses 12-14). This battle, to occur near Jerusalem (see Zech. 14:1-4), is described in chapter 16 of the book of Revelation: "... The kings of the earth and of the whole world [are marshaled by the demon world].... into a place called in the Hebrew tongue Armageddon" (verses 12-16). For thousands of years, Megiddo has been a most strategic place, the very crossroads of the Middle East. These kings and their armies meet at Megiddo, then move south to the valley of Jehoshaphat (near Jerusalem) where the climactic battle actually takes place. "And I saw the beast, and the kings of the earth, and their armies, gathered together to make war against him [the returning Christ] that sat on the horse, and against his army. And the beast was taken, and with him the false prophet. ... These both were cast alive into a lake of fire burning with brimstone. And the remnant were slain with the sword of him that sat upon the horse... and all the fowls were filled with their flesh" (Rev. 19:19-21). As we read earlier, this same annihilation of the beast is described in Daniel: "... I beheld even till the beast [the human head of the coming ten-nation combine] was slain, and his body destroyed, and given to the burning flame" (Dan. 7:11). In the Bible a king often represents a kingdom (see Daniel 2:38-39; 7:17, 23). So these "beasts" are human governments or kingdoms which have plundered and destroyed the nations down through the centuries. They have acted like wild beasts. That appears to be why God compares them to ravening animals. Now return to the eleventh chapter of Daniel. We have seen that the king of the north was Syria — until that nation was swallowed up by Rome and became a part of the Roman Empire. From that time forth, the successive kings of the north were the successive leaders of the Roman Empire. We have also seen that the Roman Empire would have seven heads or revivals, beginning with Justinian in A.D. 554. The seventh (last) head of this Roman Empire is yet to arise — maybe sooner than we think! The Mussolini-Hitler kingdom was the sixth head of the beast. The next leader to unite the peoples of Europe will constitute the "beast" mentioned in Daniel and Revelation. He will also be the "king of the north" mentioned in Daniel 11:40-45. Why will this king of the north become involved in the Middle East? Because the Mideast is of great strategic importance. It is at the very geographical center of the earth — the vital crossroads between three continents. Also, it is very important because it boasts over 50 percent of the world's proven oil reserves. Now let's pick up that part of this prophecy that has been fulfilled in just the last 80 years: "And at the time of the end [this was in 1895-1896] shall the king of the south [Ethiopia] push at him [Italy in Eritrea]: and the king of the north [Italy under Mussolini] shall come against him like a whirlwind [from the air with fighter planes and bombers], with chariots, and with horsemen, and with many ships; and he shall enter into the countries, and shall overflow and pass over" (verse 40). Mussolini fulfilled verse 40 — but not verse 41. Mussolini as "king of the north" did not enter into Palestine. He was stopped in Egypt. Which countries will the prophesied king of the north enter? Which nations will he conquer? Verse 41 shows that he will move into what has been called Palestine: "He shall enter also into the glorious land [the Holy Land], and many countries shall be overthrown: but these shall escape out of his hand, even Edom, and Moab, and the chief of the children of Ammon." What about Egypt? Will it be subject to the coming king of the north? "... And the land of Egypt shall not escape" (verse 42). Verse 43 says that "the Libyans and the Ethiopians [meaning the Cushite peoples of the Sudan and probably Ethiopia] shall be at his steps [borders]." But at this point in time, the king of the north is going to hear some alarming news — probably a military threat from Russia and those nations allied with her. "But tidings out of the east and out of the north shall trouble him: therefore he shall go forth with great fury to destroy, and utterly to make away many" (verse 44). Notice how this king will move his headquarters to Jerusalem: "And he shall plant the tabernacles of his palace between the seas in the glorious holy mountain; yet he shall come to his end, and none shall help him" (verse 45). He will set his palace in Mount Zion, which is situated between the Mediterranean and Dead seas. We have already seen that the beast of Revelation 17 and 19 will fight the Messiah at the valley of Jehoshaphat — near Jerusalem. But a "false prophet," a great false religious leader, will also move his headquarters to Jerusalem. This is indicated in II Thessalonians 2:1-8. This same "false prophet" is called the "man of sin" and the "son of perdition" (II Thess. 2:3). He is described as one "who opposeth and exalteth himself above all that is called God, or that is worshipped; so that he as God sitteth in the temple of God, shewing himself that he is God" (verse 4). The king of the north is going to move to Mount Zion, and he will be joined there by the false prophet who will work great miracles. This king of the north (also called the "beast") will at a later date take half of the people of Jerusalem into captivity (Zech. 14:1-2). The beast and false prophet will both be in Jerusalem to oppose Christ when He returns to this earth in dazzling power and glory. The horrible punishment of these two evil leaders is described in Revelation 19:20. Now notice Jesus' prophecy regarding Jerusalem at the time just before His second coming: "And when ye shall see Jerusalem compassed with armies, then know that the desolation thereof is nigh. Then let them which are in Judaea flee to the mountains.... For these be the days of vengeance.... For there shall be great distress in the land, and wrath upon this people" (Luke 21:20-23). Verse 24 has certainly not yet been completely fulfilled — even though it was partially fulfilled in A.D. 70 when Jerusalem was destroyed by Roman armies: "And they shall fall by the edge of the sword, and shall be led away captive into all nations: and Jerusalem shall be trodden down of the Gentiles, until the times of the Gentiles be fulfilled." God tells of a coming great battle to occur near Jerusalem: "For I will gather all nations against Jerusalem to battle; and the city shall be taken, and the houses rifled, and the women ravished; and half of the city shall go forth into captivity, and the residue of the people shall not be cut off from the city. Then shall the Lord go forth, and fight against those nations, as when he fought in the day of battle" (Zech. 14:2-3). Then occurs the terrible destruction which will befall those who fight against Christ at Jerusalem: "And this shall be the plague wherewith the Lord will smite all the people that have fought against Jerusalem; their flesh shall consume away while they stand upon their feet, and their eyes shall consume away in their holes [sockets], and their tongue shall consume away in their mouth" (Zech. 14:12). The mighty power of God will bring about this instantaneous death. It even sounds somewhat like what happened at Hiroshima and Nagasaki! Prophecy reveals that there will continue to be further strife and bloodshed in the Middle East. Neither the United Nations nor any other power or nation will be able to find a workable solution to today's vexing Mideast impasse. There will be more talks, truces, and peace treaties — and more bloodletting. Bible prophecy shows that no human government will ever be able to bring to an end the hostilities in this part of the world. Only the ushering in of the ruling Kingdom of God under the leadership of the returning Jesus Christ — the Prince of Peace — will bring a permanent peace to the Middle East — and the world.